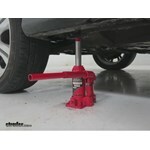 This heavy-duty hydraulic bottle jack is a perfect addition to a garage, shop, or to keep with you on the road. The oversized cast iron base allows for a more stable lift. The bottle jack locks into place for a stable, safe lift. 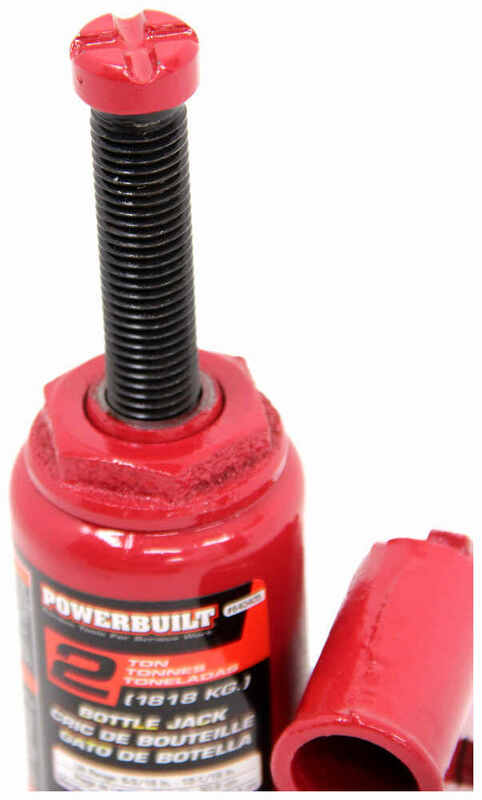 Lowest Prices for the best tools from Powerbuilt. 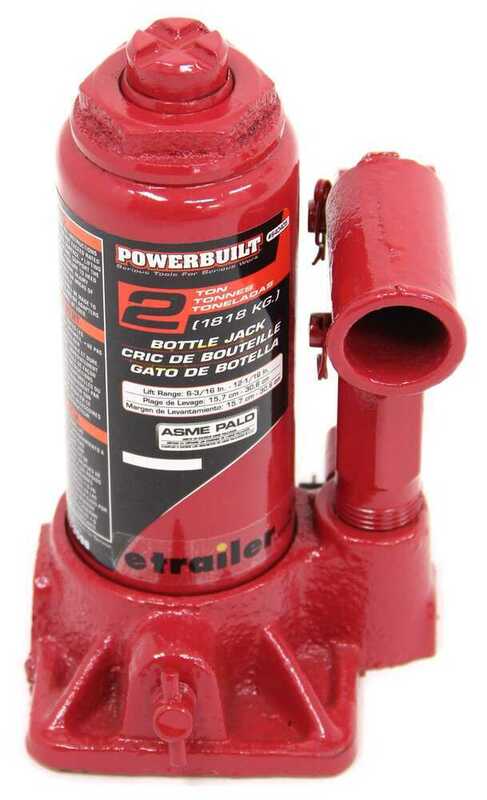 Powerbuilt Bottle Jack - 6-3/16" to 12-1/16" Lift - 4,000 lbs part number ALL640405 can be ordered online at etrailer.com or call 800-298-8924 for expert service. 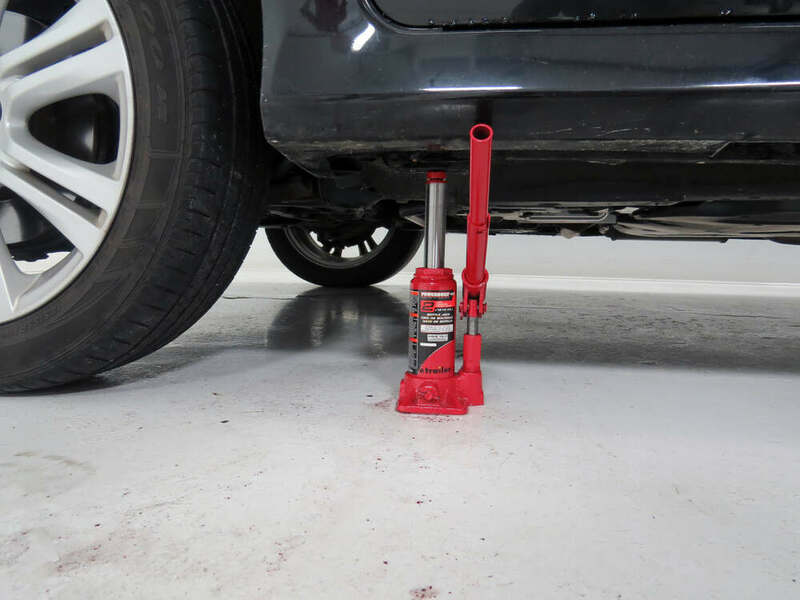 This heavy-duty hydraulic bottle jack is a perfect addition to a garage, shop, or to keep with you on the road. The oversized cast iron base allows for a more stable lift. The bottle jack locks into place for a stable, safe lift. Note: This jack is designed to lift and stabilize 4,000 lbs and should not be used to lift over 4,000 lbs. Begin using the bottle jack by placing it on solid, level ground in a vertical position under the vehicle or object you wish to lift. 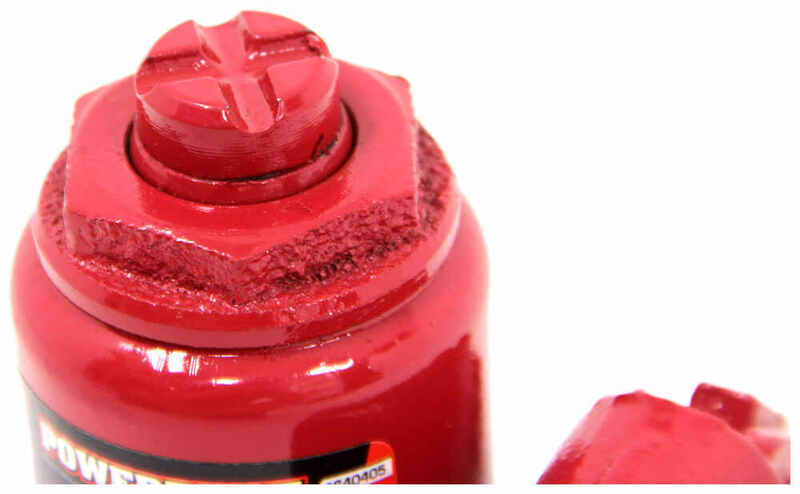 Determine the best lifting point to support the jack and line up the piston ram underneath it. Once everything is lined up correctly, turn the lever switch at the base of the piston clockwise to allow you to move the piston up and down. 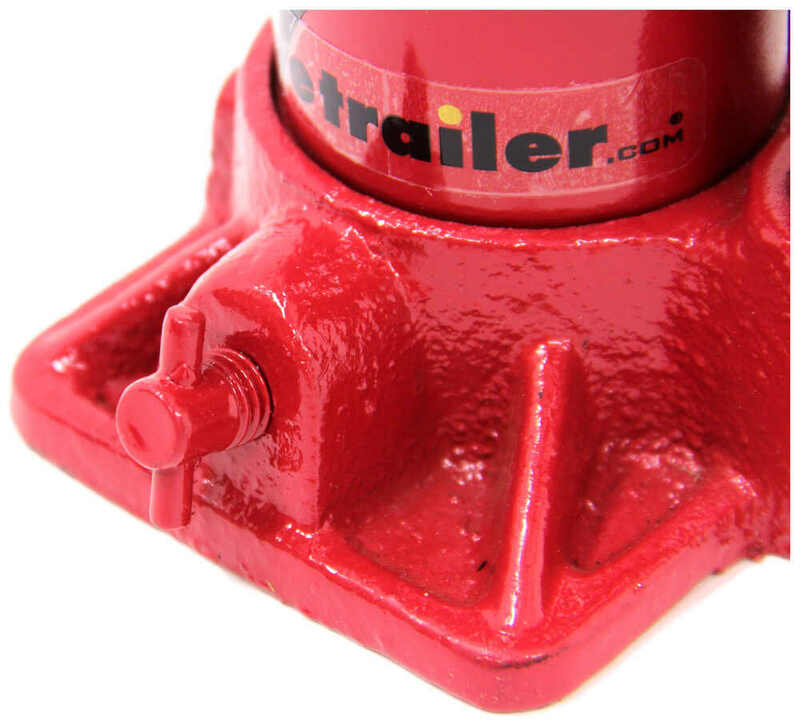 After you have the vehicle or object lifted to the desired height the jack will automatically lock into place. To unlock the jack, simply turn the lever at the base of the piston counterclockwise and the hydraulics will slowly move in a downward motion. 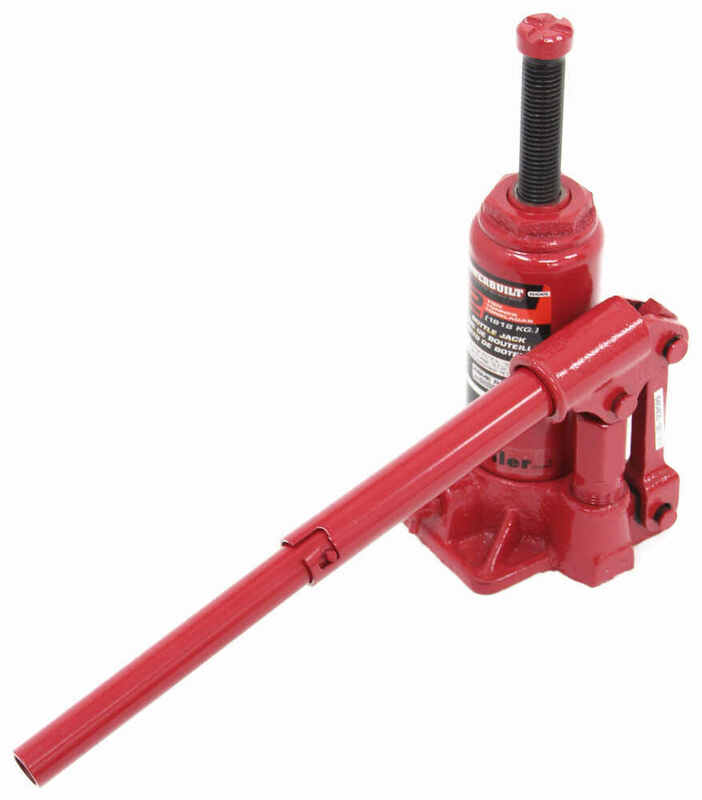 The hydraulic bottle jack lifts, holds, and locks vehicles in place without jack stands. Fitting unibody framed vehicles, the Unijack is perfect for cars, crossovers, and small SUVs and trucks. 18-3/8" Lift range with 4,000 lbs capacity. 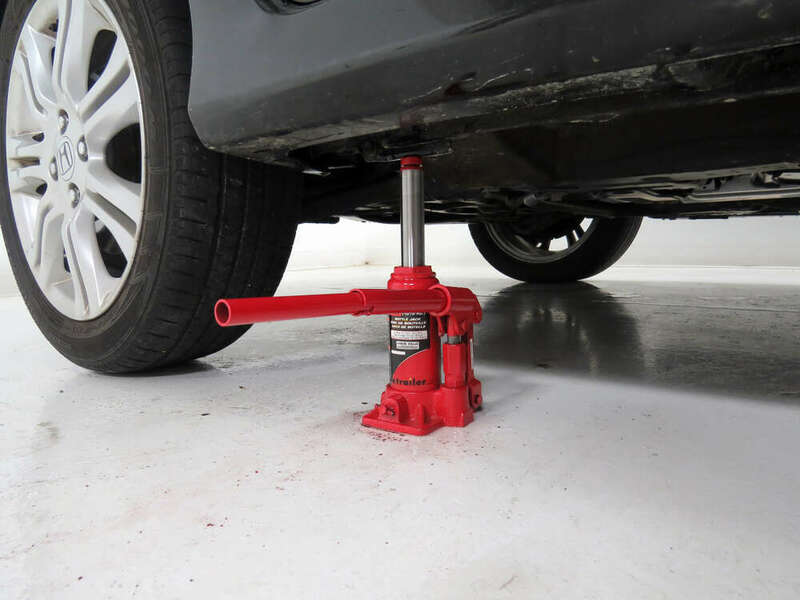 The hydraulic bottle jack lifts, holds, and locks vehicles in place without jack stands. Properly fitting unibody framed vehicles, the Unijack is perfect for cars, crossovers, and small SUVs and trucks. 21" Lift range with 6,000 lbs capacity. 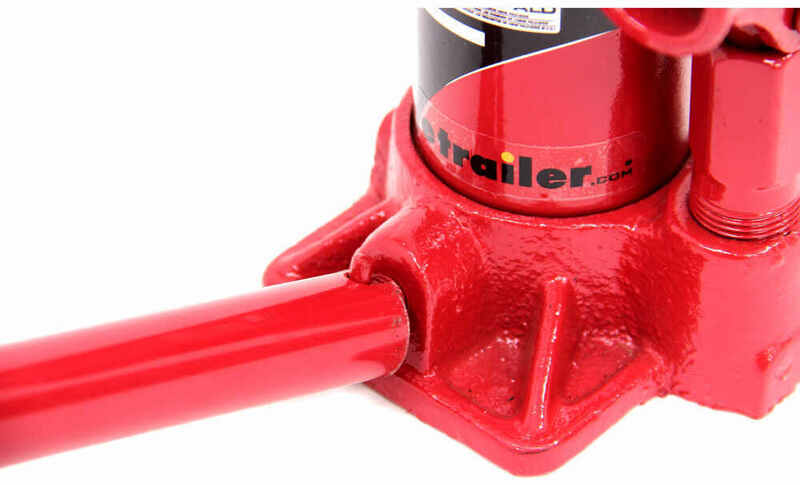 Stabil-Step Stabilizer Jack for Step Assembly - 750 lbs - 8" to 15"
Today we're going to be taking a look at part number ALL640405, this is the Powerbuilt bottle jack rated at 4,000 pounds. The jack is hydraulic operated, it's going to be used to raise and lower loads up to 4,000 pounds. It's going to be great for the garage, workshop, or to keep in your vehicle maybe as a spare or as your primary jack. It's got the nice handle, it's very easy to assemble, two pieces slide together and then they interlock. 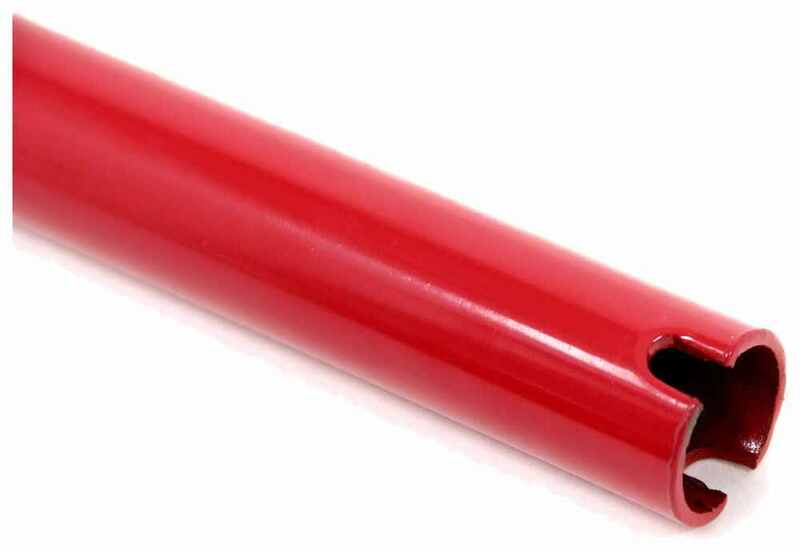 The other end of the handle is designed to go over the release valve to operate that, that way you don't have to do it using your hand or any other type of tool. The jack's going to feature a lift range of 6 3/16" and with it all the way up and the screw top extended all the way out, it's going to give us a maximum lift of 12 1/16". That screw top is going to provide some extra height. It's got a nice rugged design you can see how those indentions cross there, that's going to allow us to really grab onto the frame for a nice secure hold while we're lifting. Particular measurement of the diameter of that top portion right there, that's going to give us a measurement of about 7/8". It's also got the nice heavy duty base for strength and durability as well as a steel saddle and cast handle socket. This base is going to give us a measurement from edge to edge here at the widest point, looks to be about 3 3/4" and then measuring this direction, edge to edge it's about 3 5/8". The piece down here at the bottom, this is going to be our screw pin release valve and again we have the other side of the handle to operate that fairly easy. Now you do want to make sure that the screw pin is all the way closed, that would be turning it clockwise before we're wanting to use the jack. Then we can place our handle inside that pump right there, that will pump this up and down. That's going to raise that center cylinder. Really easy operation. It's going to help raise up the vehicle and then we can place some jack stands beneath the vehicle for support and to really spread out that support and then when we're ready to lower the vehicle down onto the jack stands we can simply place our handle over the valve, turn that slowly counterclockwise and as weight's applied that center cylinder is going to depress fully into the jack. Now when you're ready to store this you always want to store it with the jack in the fully lowered position, that's going to prevent the critical areas of the jack from exposure which is going to prevent them from excessive corrosion. 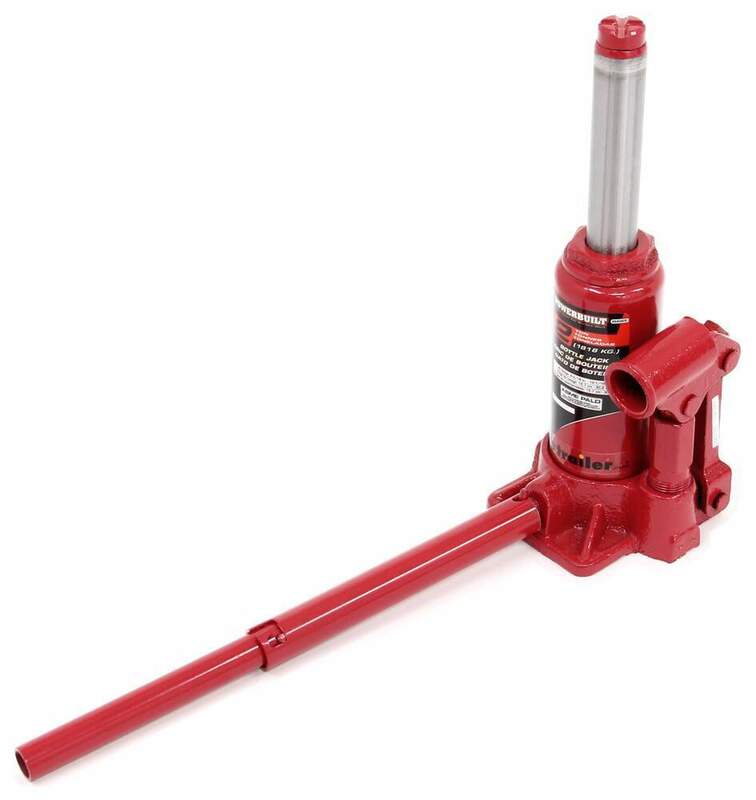 That's going to do it for our review of part number ALL640405, this is the Powerbuilt bottle jack with a capacity of 4,000 pounds. .
Order: RelevanceNewestRating - High to LowRating - Low to High This heavy-duty hydraulic bottle jack is a perfect addition to a garage, shop, or to keep with you on the road. The oversized cast iron base allows for a more stable lift. The bottle jack locks into place for a stable, safe lift. Trailers tend not to have a suspension that travels 8 or more inches, which is the amount of lift provided by the Rapid Jack # AM3620. If the axles are far enough apart or the ground is not level it could be an issue though. That's why its tough to beat a good ol' bottle jack such as # ALL640405. Scissor jacks such as # UF48-979031 aren't designed to lift wheels off of the ground but just to provide support on trailers or RVs to limit side to side movement. What I recommend is a bottle jack such as # ALL640405 which costs less and is rated for much more weight. The only type of trailer jack we can recommend for changing a trailer spare is a bottle jack like the part # ALL640405 which would work well with your Yakima Rack and Roll trailer like part # Y08107. 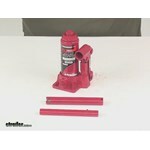 Ultra-Fab stabilizer # UF39-941705 can be used to both stabilize and level trailer. But it is not designed to lift the trailer tires off of the ground. You would need to use a jack for that. I like bottle jacks such as # ALL640405 because they are compact and easy to store. This one is rated for 2 tons so that is more than enough to lift one side of the trailer to change a tire. The Powerbuilt 4K Bottle Jack # ALL640405 when fully retracted to its lowest height stands 6-3/16-inches tall. This is with the cylinder fully retracted and with the threaded top cap fully tightened. 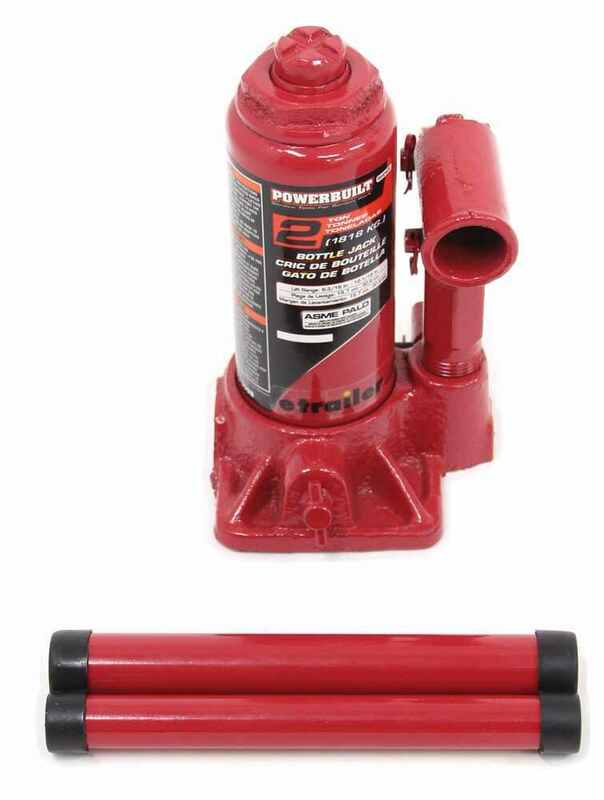 The Powerbuilt Bottle Jack # ALL640405 has the lifting capacity of 4,000 lbs. Your Sorento weighs near that depending on how it's equipped, but since this would not be lifting the entire weight of your vehicle and only one corner at a time it would work well. For a jack with more lifting height the part # ALL620471 which can lift 21 inches would be the better choice.